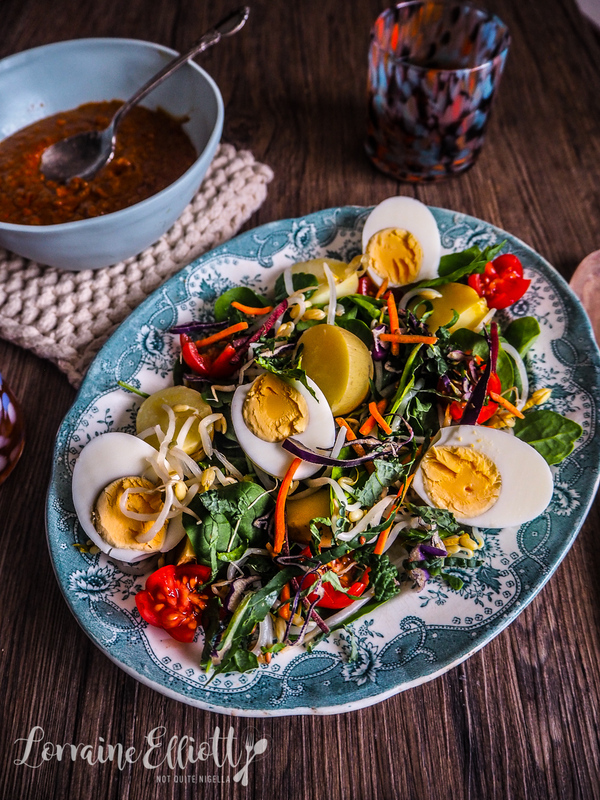 Gado gado is a wonderfully tasty salad to enjoy where a lot of the prep can be done ahead of time. It is also one of the most versatile salads-simply steam vegetables or have them raw and top them with this creamy, easy peanut satay sauce. 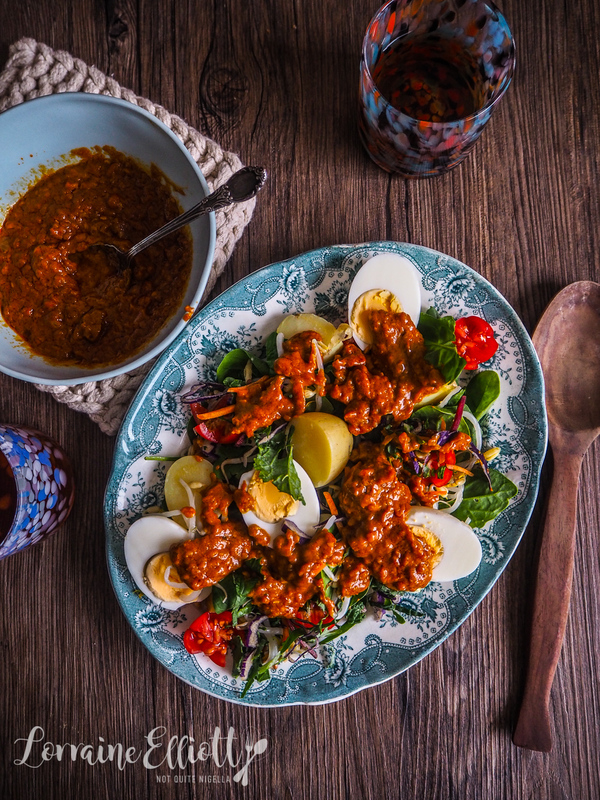 For the amount that I love gado gado I don't make it that often and I don't know why. I'm forever trying to use up vegetables that I've bought while they are at their peak. The reason why I went with this was to use up a jar of peanut butter that I bought but didn't love. This was a great meal to have at the end of a long day as I just kept it in the fridge ready for when we returned home (and psst it also makes for a fantastic lunchbox lunch too!). Earlier Mr NQN and I had been out looking at an evening property inspection. We've been looking for somewhere a bit place to move to and he and I have been trying to find somewhere that suits us both. I want somewhere close to the city like Glebe, Waterloo, Redfern and Alexandria and he wants more garden space so he is looking at the Inner West like Dulwich Hill and Marrickville. He found a house that he quite like. I think it was because it was a bit hippie with lots of buddha statues, Indian silk and lotus flower lamps. I wasn't as keen. We sort of kept our feelings to ourselves until we were out of earshot of the real estate agents as I don't want to be rude. "So what did you think?" he said hopefully. "I don't like it. It's too cold. Also it has a weird layout, like I think someone else could live there without us even knowing they were there or a serial killer could slip in while we are out and kill us while we sleep because there's no door on the bedroom," I said barely pausing for breath. Then on a roll I added, "Also I think I might die in that garden. The steps are too steep and I picture myself falling down and bashing my head on a rock or one of those bird statues and you'll come home from work and I'll have bled out. Also did you see how many plants there were? They'd all be dead within a month. Also we didn't check if it was a murder house." He response was to roll his eyes and laugh and try to persuade me about the space but I would not be moved. There was another half dozen reasons why I didn't like it but my brain dump was enough. So whilst this salad is simple, apparently I am not! 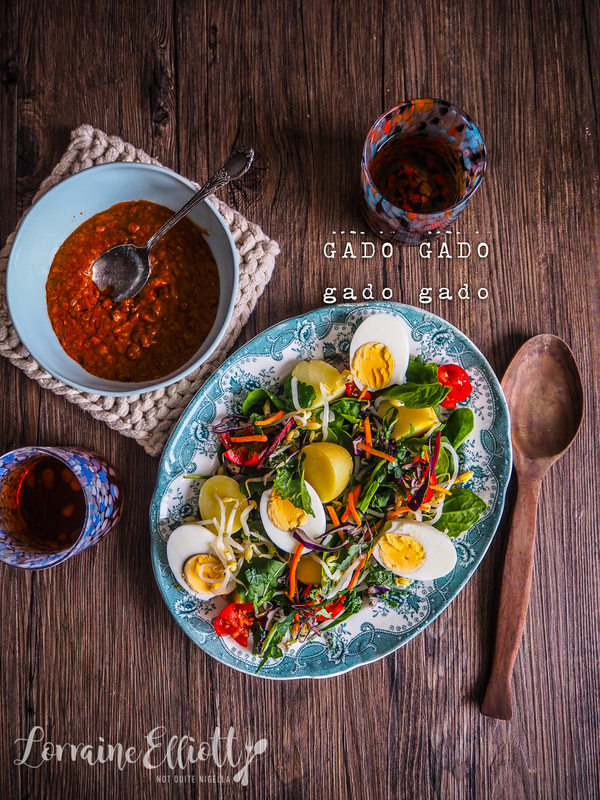 So tell me Dear Reader, do you like gado gado? And do you have a favourite meal you make ahead of time? And would people consider you neurotic? Note: this makes enough sauce for 2-3 lots of this but the salad quantity is for 2 people. Step 1 - Make the accompaniments first as this salad is served cold (warm is also fine). Step 2 - Then make the satay sauce. Add the garlic, onion and lemongrass to a food processor and process until finely chopped. Heat oil in a saucepan and fry the shrimp paste in a tablespoon of oil and break it up with a wooden spoon or spatula. Add the onion, garlic and lemongrass and fry until fragrant. Step 3 - Add the curry powder and toss with the onions until fragrant. Then add the peanut butter and sesame seeds. 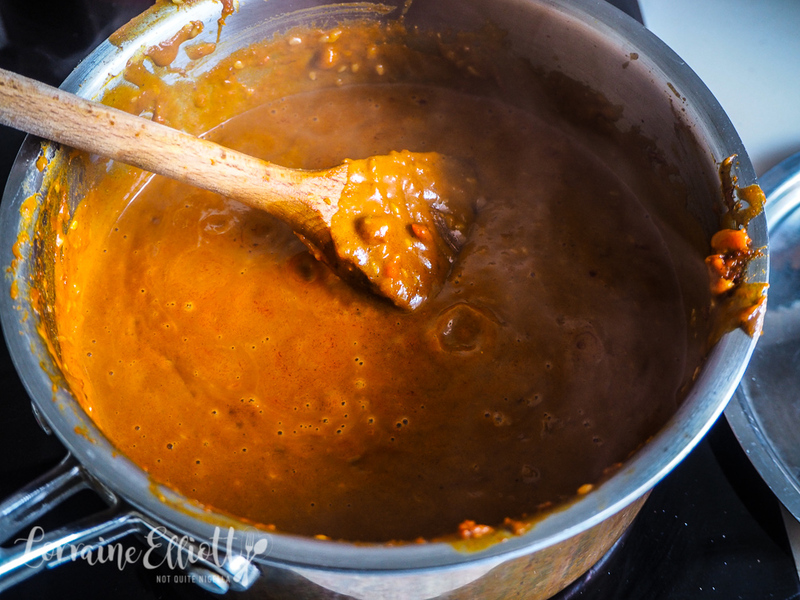 Add the tamarind juice and the water one cup at a time stirring until combined-just stop adding the water when it reaches the consistency you want. Add the sugar and salt to taste. recipeThe Totally Not Boring Red Cabbage, Chickpea & Dill Salad! recipeBrussels Sprout, Grated Egg, Red Onion & Bacon Salad! recipeBeetroot Walnut Salad With Crispy Kale, Puffed Quinoa and Goats Cheese! recipeA Three Course Dinner From Scratch in One Hour & Win A Year's Supply of Circa Home Candles! recipeSpring Has Sprung - Guacatziki aka Guacamole Tzatziki and Shaved Salad! recipeAn AMAZING Vegan Soba Salad and Red Shiso Drink! recipe The Totally Not Boring Red Cabbage, Chickpea & Dill Salad! recipe Brussels Sprout, Grated Egg, Red Onion & Bacon Salad! recipe Beetroot Walnut Salad With Crispy Kale, Puffed Quinoa and Goats Cheese! recipe A Three Course Dinner From Scratch in One Hour & Win A Year's Supply of Circa Home Candles! recipe Spring Has Sprung - Guacatziki aka Guacamole Tzatziki and Shaved Salad! recipe An AMAZING Vegan Soba Salad and Red Shiso Drink!